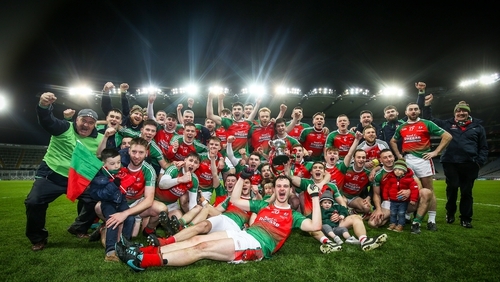 Kerry clubs made it a double success at Croke Park, with Kilcummin winning the All-Ireland IFC title, beating Antrim champions Naomh Éanna by 5-13 2-09. Kerry panellist Kevin McCarthy’s breathtaking attacking display saw him hit 3-7, all from play. The Munster champions, with goals from Matt Keane, Kevin McCarthy and Kieran Murphy (pen) led by 3-6 to 2-4 at half-time, with Eoin Nagle and Kristian hitting the Naomh Éanna goals. The Kerrymen started the game at a blistering pace and tempo, slicing through a nervous and unsettled Naomh Eanna defence to strike for early scores. Less than two minutes had elapsed when Kevin McCarthy charged through to bring a save from Paddy Flood, with the loose ball falling to Matt Keane for a thunderous finish to the roof of the net. They should have had another when Kieran Murphy and Gary O’Leary combined, but McCarthy’s palmed effort cleared the crossbar, but they did claim goal number two in the seventh minute when McCarthy picked his spot in the bottom corner, following incisive build-up play involving Noel Duggan and Shane McSweeney. Nine points behind before they had even got to grips with their daunting surroundings at GAA Headquarters, the Antrim men had to quickly grasp reality and play themselves into the game. Odhran Eastwood got them going with a couple of points, and on 14 minutes, Eoin Nagle smashed a sensational finish to the top corner of the net for a brilliant goal. Ruairi Scott sent Kristian Healy through for a second Naomh Eanna goal seven minutes later, but they still trailed by two, with the lethal McCarthy having already hit 1-3 from play. And Kilcummin were awarded a penalty for a foul on Duggan in the 22ndminute by goalkeeper Flood, who was black-carded. Substitute Michael Morgan’s first task was to face Kieran Murphy’s penalty, and the midfielder duly slotted the kick to the bottom corner of the net. They owned the ball in the closing stages of the half, at one stage stringing together 21 consecutive hand-passes, before taking a 3-6 to 2-4 advantage to the dressing room. Brendan Kealy’s kick-outs launched attacks from deep, and the former Kerry goalkeeper showed he hasn’t lost the magic touch as he pulled off a brilliant save from Kristian Healy. McCarthy’s attacking threat showed no sign of waning as he clipped over two more points, and the margin grew to nine within ten minutes of the restart. Ruairi Scott swept over a couple of eye-catching points as the Glengormley men continued to battle with spirit. But Donal Maher and Kieran Murphy were inspirational as the Kerrymen closed ranks at the back, sweeping back downfield for McCarthy to slot over yet another inspiring score. And McCarthy wasn’t finished yet. He set the game alight with a brilliant goal to round off a sweeping move involving Shane McSweeney and Chris O’Leary, and he danced in for a magnificent third to cap a dream display at GAA HQ. Kilcummin: B Kealy; S O’Leary, D Maher, D Moynihan; P Casey, C O’Leary, W Maher; K Murphy (1-01, 1-0 pen), K Gorman; S McSweeney, G O’Leary (0-02), P Nagle; N Duggan (0-01, f), K McCarthy (3-07), M Keane (1-0). Naomh Eanna: P Flood; K Jennings, D Gault, M McNamee; C Lyttle, J McAuley, C McAuley; P Curran, J Maskey; P Healy, R Scott (0-02), K Healy (1-00); E Gibson, O Eastwood (0-07, 5f), E Nagle (1-00).